Triton's Surface Features Defy Explanation - it's like a giant cantaloupe melon! Triton's Surface Features Defy Explanation- it's like a giant cantaloupe melon! Tritons surface features display characteristics that are not found on any other known celestial body. How they came to be as they are defies explanation. 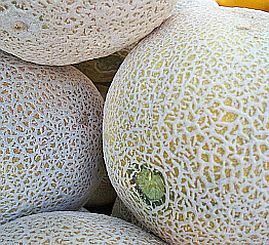 It resembles a giant cantaloupe melon! You can tell which is which, can't you? Triton, despite its distance from the Sun (2.5 billion miles), is, by no means, a dead world. It is very much an active moon, in the geological sense and is dotted with objects called "cryovolcanoes". The name simply means that they are volcanoes that eject such compounds as water, methane or ammonia, as opposed to the conventional molten rock spewed out by "traditional" ones. The surface layer consists of 55% frozen nitrogen, with the rest being made up of water ice and "dry ice" (frozen carbon dioxide). In effect, this acts like a layer of glass and, as such, traps the weak rays from the Sun and creates a sort of greenhouse effect. This is what creates the cryovolcanoes. Yes, that's what this area of Triton has been christened. Despite the impression you've been given so far, this strange terrain doesn't cover the entire moon. It occupies a significant part of its western hemisphere. It is thought that this is the oldest part of Triton's surface. The features are depressions around 20 miles across. They cannot be a form of impact crater, due to their uniform appearance and smooth sides. 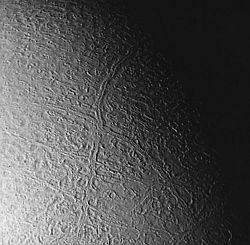 In short, no-one knows what accounted for Triton's surface features in the "cantaloupe terrain". This type of feature has never been observed on any other world. It doesn't end there. Triton is the only major moon in the solar system to have a "retrograde" orbit - that is, it orbits in a direction opposite to its host planet's rotation. Also, the moon, despite being so far from the Sun, appears to be actually warming up, very gradually! The only way to account for this is that Triton has some internal mechanism, generating heat. This could be due to radioactive decay in the moon's core, it has been suggested, but, once again, no-one knows for sure. This heat could have also created a vast subterranean ocean and the natural follow-on from the presence of water is the possibility of life! Life inside Triton! What next?